How does the phone detect if 3.5 mm jack circuit is closed? I have an android phone to which i have plugged an earphones. So at the top of the phone, I get the headphone symbol which indicates that the earphone is connected (In other words, the circuit at the 3.5 mm jack is closed). Then I cut the two earphones (transducers) from it, and still the headphone symbol shows. When I later cut this cable, below where it branches out, even then it shows circuit completion. How does the phone detect circuit completion at the 3.5 mm jack and thus trigger all sound and music to be directed through the 3.5mm jack? Headphone jacks have extra contacts inside, which act as switches. 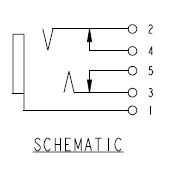 The the drawing below, pins 4 and 5 are intended for sensing that the plug was inserted. They are not intended for audio signal. When the plug is not present, the switche, which are formed by 2 & 4 and 3 & 5, are closed. When the plug is inserted, these switches are open. The plug flexes 2 and 3 slightly, and they break contact with 4 and 5. You could insert a 3.5mm plastic rod [a dummy] into the jack, which will open the contacts, and the phone might think that earphones are plugged in. Source: datasheet for a typical stereo jack. yes, quite a few headset jacks include still an insert detect switch, which may also be a signal switch for simple (mono) headsets. when the insertion is detected by some means, the headphone amplifier may enter a detection mode (see e.g. WO 2006045617 A3 patent application) where the host device detects what is connected (stereo headphones, mono headset with mic, stereo headset with mic, video connector, etc.) and in which order the ground and microphone wires are. This is included in the latest revision of the OMTP headset standard. This kind of detection wouldn't be fooled by a non-connected plug in the original question. Apple 3.5 mm jacks employ a proprietary device identification chip connected across the microphone line. This performs a handshake when the accessory is inserted and headset controls use this for controls. If an Apple device doesn't find this chip in a headphone it assumes that it is a basic stereo headphone without a microphone or any controls. There is definitely an additional contact (and in some jacks, two!) that is connected to ground when the jack is empty, and is mechanically lifted from ground as soon as a plug of the proper diameter is inserted. This extra, non-audio circuit is opened as soon as the tip of the plug acts on the contact mechanism, and remains actuated until the plug is completely removed. What I just described is called a "normally closed" switch. Some jacks contain a "normally open" switch instead, which is the opposite of what I just described, as it connects to ground only when a plug is in the jack. In either case, the additional mechanical switch has nothing to do with the audio signals, and does not make any contact with the wiring connected to the plug. This additional mechanical switch is very well-insulated from all the wires and contacts that are connected to the audio circuitry, as it could really mess things up if it wasn't! This additional mechanical switch simply provides a signal to the equipment to allow it to sense when something has been inserted into the jack, and then act accordingly. It's a relatively recent development, say no more than 20 years ago. The "inserted" signal pretty much needs to be acted upon by digital circuits like computers and sound cards, so it's not very effective in an old-school, pure- analog device. Back in the pre-computer/smartphone days, some jacks included mechanical switching to disconnect the signal flow from it's normal destination and instead direct it to whatever was plugged in. This usually served to disconnect the speakers when headphones were plugged in, but with modern, high power amps, it is more than a little dangerous to do that, as it could blow up headphones, amps and eardrums. A previous comment included a schematic diagram of that kind of jack. Most jack sockets include a switch that is opened when a jack is inserted. Not the answer you're looking for? Browse other questions tagged audio cellphone mobile or ask your own question. Do 3G and phone calls(gsm) use the same antenna in a mobile phone? Electrical specification for minimum bias current available from 3.5mm cellphone microphone input?